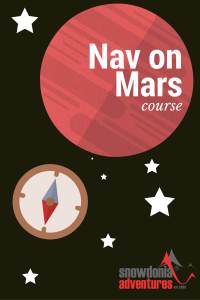 We heard that the clever people at Ordnance Survey had created a digital map of the planet Mars, and as we have a love (or perhaps an infatuation) with their lovely maps, we’re very pleased to announce that Snowdonia Adventures will be the first navigation course provider on Mars. The first two-day course will be held on 1-2 April 2037, but we’re taking bookings now. The course will be suitable for those who have good navigations skills and experience of hiking in the UK mountains and are ready to take their skills a little, or rather, quite a bit further. What kit do I need? You will need clothing and footwear suitable for the weather that can be encountered on Mars at the time of your course. You should also have a packed lunch and drinks in addition to your Mars hiking kit. We will email you a specific kit list in good time for you to purchase some of the more expensive items, such as a special jacket and trousers and heavy boots. ** Travel to Mars and accommodation is not included. In the meantime if you think your navigation skills could do with a brush up before this course date, take a look at this year’s Navigation Courses in Snowdonia.